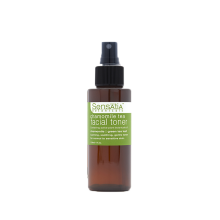 Calming toner for normal to sensitive skin. Mmmm, chamomile; soothing, sweet, fruity, herbaceous & crisp. Sensatia’s chamomile tea facial toner is a heavenly blend of aloe juice & honey, roman & german chamomile essential oils; accented with rich extracts of green tea, starfruit, gotu kola & papaya. Toners are used after cleansing to remove traces of cleanser & tap water; to balance skin pH; to nourish with beneficial plant actives & to calm, cool & refresh. Sensatia toners are very gentle; never containing alcohol, sulfates or parabens. Always 100% pure & simple, natural & wholesome. Water (Aqua), Aloe Barbadensis (Aloe) Leaf Juice, Alcohol Denat., Anthemis Nobilis (Chamomile) Oil, Honey, Sodium Citrate, Citric Acid, Camellia Sinensis (Green Tea) Leaf Extract, Matricaria Chamomila (Chamomile) Oil, Averrhoa Carambola (Star Fruit) Extract , Carica Papaya (Papaya) Fruit Extract, Centella Asiatica (Gotu Kola) Extract.